Material:colorful rhinestones and beaded,delicate hardware closure buckle, Smooth lining..
Dimension:16.5* 12* 6CM/ 6.5"*4.7"* 2.4" please check the size before order,You can easily fit your Iphon, cards, money, car keys, mirror, lipstick and other little thing. 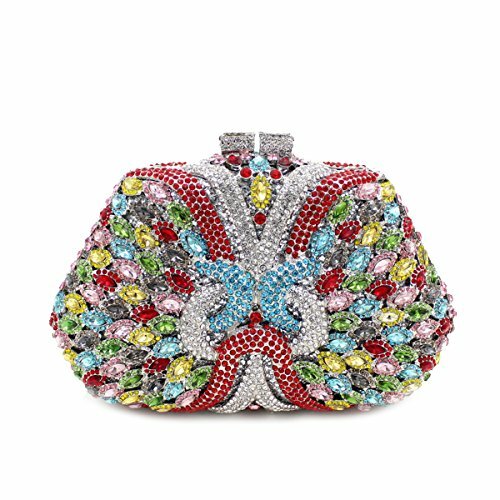 Characteristic:The bridesmaid bags is handmade by rhinestones and beaded,It makes you elegant when you hold this purse;As a great gift for your female friend or yourself. Occasion:Stylish, leisurely design can be used as a daily clutch when you're out of the street and have a vocation. Exquisite, elegant design can be used as evening bag when you attempt wedding party, banquet and special party. Material:colorful rhinestones and beaded,delicate hardware closure buckle, Smooth lining. If you have any questions about this product by Flada, contact us by completing and submitting the form below. If you are looking for a specif part number, please include it with your message.